GRU offers rebates to convert appliances from electric, oil or LP gas (liquefied petroleum) to an energy-efficient natural gas model. These rebates do not apply for replacing an older natural gas appliance with a new model. Customers who live within GRU's natural gas service area may combine GRU's natural gas conversion rebates to qualify for up to $1,600 per location. You may also qualify for federal energy-efficiency tax credits. GRU Partnering Contractors enter into signed agreements with GRU to promote natural gas conversion. Customers must use a partnering contractor to qualify for rebates. 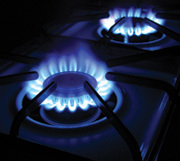 Natural gas is highly efficient, using more than 90 percent of its energy potential. In fact, it can cost 50 percent less to cook with natural gas versus electricity. GRU’s gas distribution system extends more than 700 miles and is part of a remarkable underground energy highway that extends more than two million miles, safely transporting and distributing energy to users across the country. As a natural gas operator, we are dedicated to maintaining and improving upon the safety of this system. For additional information or to find out if you qualify for a rebate, please call our Gas Marketing Department at 352-393-1464.